Founded in 1951 AslanTrends is committed to produce top quality natural yarns from South America. Be sure to look for AslanTrends luxury yarns in the knitting store nearest you. 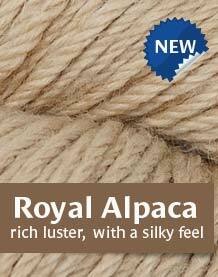 Alpaca fleece is a premium fiber and in high demand in the Knitting, crochet & fashion industry. It is light-weight, warm, durable, soft and not itchy. Handspinners appreciate its quality, and handcrafters find it easy to work with. The natural hues are highly desirable, yet light colors readily accept dye. Alpaca fleece normally grows 3"–4" per year. A full-grown coat averages 5–10 pounds, with exceptionally wooly, mature, unshorn animals bearing as much as 20 pounds. If shorn, it takes two years for most normal coats to grow back. Of all the attributes of the Alpaca, its history is the most interesting part of this animal. The oldest known recording of these charming creatures was 1,000 years before the great pyramids of Giza. The Inca nobles demonstrated their wealth by the number of Alpacas they owned, as well as showing off the beautiful fur garments. The trade in the fur of the Alpaca, 2,000 years after the great pyramids, created a thriving South American economy. So it continued for thousands of years with these magical animals creating wealth and prosperity for their Inca owners, until the 17th century when the Spanish Conquistadors conquered the Inca Empire. The Incas sought refuge from the Spanish, and took a limited number of these precious animals to the heights of the Andes. If this had not happened, there may not be many Alpacas left today. The special charm of this mysterious breed has been a well kept secret except for the limited people who have the privilege to keep such a prize. The reproductive periods for the Alpacas are from 4-16 years. In the Andes the mating period is in August and September. The Alpaca has crias [babies] about every 11 months, which weigh 15–20 pounds at birth. They live 15–25 years, with a few living up to 30 years. The Alpacas live in herds. They live at elevations of 14,000 to 16,000 feet and on ranches throughout the world. The Alpaca has very thick fur to survive the cold climate of the Andes. Its long neck helps spot predators among the rocks of the mountain slopes. The Alpaca is a herbivore, which means that it eats plants. The Alpaca grazes on grass and eats weeds, shrubs and trees. It has special stomach secretions that help it absorb 50% more nutrients than a sheep, allowing it to survive where there is only poor quality grass. The Alpaca is prey to pumas, leopards, and other carnivores in the wild. The Alpaca were almost extinct following the invasion of the Spanish conquistadors in regions of South America. They are now plentiful in the wild at about 3.5 million strong. These animals have been domesticated for over 5,000 years.